Rajasthan is the most favored tourist destination among the tourist’s attractions of India. Rajasthan is very correctly known as the Royal State of India and it is quite unique and offbeat than other tourist destination of India and this makes it globally famous. The distinguished features of Rajasthan are its timeless monuments, palaces, royal charm, fairs, its rich culture and festivals. Tourists also get attracted to this state because of its wildlife tourism as the state has some of the world renowned national parks and sanctuaries. 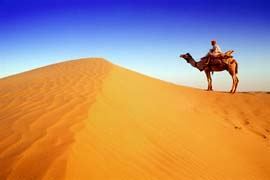 Thousands of tourists from all over the world come to Rajasthan to explore its enchanting tourism all the year round. The charm and tourist attractions of this state makes its tourists fall in love with the state and those who comes once to visit this state gets captivated by its attractions. The state of Rajasthan has many fascinating attractions for its tourists that depict the glorious past and the cultural beauty of bygone era. There are many mesmerizing tourist attractions in the state that are worth visiting and exploring by all the visitors who visits the state of Rajasthan. All the cities of Rajasthan are full of charming tourist attractions that are more than enough to tempt its visitors to make a tour of its cities. Jaipur, Jaisalmer and Udaipur are the most visited cities among all the cities as these cities are gifted with countless attractions that are worth visiting and exploring. The royal state of Rajasthan gains remarkable tourist interests because of it’s historical importance, beautiful palaces and forts, monuments, sand dunes, wild life sanctuaries, luxury trains and coloured cities. Jaipur known as the pink city, is the state capital city of Rajasthan. Jaipur city is famous for its renowned culture and tradition & magnificent forts, palaces, temples, gardens and jewelry. The famous Hawa Mahal, Jantar Mantar and Amber Fort are the main tourist attractions of Jaipur. The Pink City got its name as the top view from the majestic buildings gives the picturesque appeal of a city painted in pink. Jaipur is the first planned city of India, located in the desert lands of Rajasthan. The city that once had been the capital of the royalty, now serves as the capital city of Rajasthan. The very structure of Jaipur resembles the taste of the Rajputs and the Royal family. In the present date, Jaipur is the major business centre for the natives of Rajasthan with all requisites of a metropolitan city. The city of Jaipur, painted in pink, grasp the appreciation of every visitor. One can see that hoary charm still alive in the avenues of Jaipur. Jaipur, one of the most sought after tourist destinations of Rajasthan, India. The glorious city boasts of its cultural heritage from every nook and corner. Jaipur is the reservoir of Indian customs, traditions, civilization and legacy. Jaipur lies at a distance of 260 kms from Delhi, the capital of India and the city is well-connected with other major cities of India. Every year, People across the globe come to experience this royal capital city of Rajasthan. Hawa Mahal is pink coloured and it is designed with a unique collection of windows arranged in such a way that it circulates cool air. Amber Fort too is built with marble and red stone, which contributes to the colour of the city.Hawa Mahal is a major landmark and a famous tourist attraction of Jaipur. The Palace offers a beautiful sight to behold. The splendid Rajputana architecture of Hawa Mahal, still speaks the glory of the royal family. However, one can also find a glimpse of Mughal architecture, which is blended perfectly to make it different from others. The literal meaning of Hawa Mahal is Palace of Winds. Hawa Mahal was built by Maharaja Sawai Pratap Singh in 1799. One cannot possibly describe the beauty of the Palace in words. The golden light of the early morning sun floats beautifully through the windows of this palace creating a wonderful sight for one and all. The palace has to be visited to experience the true beauty. The Rambagh Palace of Jaipur is worth mentioning for its historical importance spread over nearly two centuries. The grand palace is converted to a luxury hotel, taken over by the Taj Hotel Resorts and Palaces. The art gallery at City Palace and Rajasthan Government’s Rajasthali Emporium on Mirza Ismail Road are the prime locations for shopping in Jaipur. Udaipur is a beautiful city draped with lakes. It is also known as the city of lakes. The Lake Palace of Udaipur is an astounding tourist attraction of the city. This palace is one among the most beautiful palaces of the world. One can reach the palace hotel only by a boat ride. The palace is completely built with white marble and is converted to a luxury hotel. 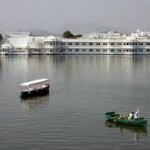 Udaipur Lake Palace offers a panoramic view of the lake together with the palace. It gives an illusion that the palace is floating over the lake. Jodhpur is yet another city of significance in the royal state of Rajasthan. Jodhpur is also known as the blue city. This city is also blessed with many forts, palaces and temples. Umaid Bhawan Palace, Mehrangarh Fort, Jaswant Thada Memorial, Mandore Garden, Desert Safari, Balsamand Lake Palace, etc are the important tourist attractions at Jodhpur.Jodhpur “The Sun City” was founded by Rao Jodha, a chief of the Rathore clan, in 1459. It is named after him only. Jodhpur in Rajasthan, India was previously known as Marwar. Jodhpur is the second largest city in Rajasthan. It is divided into two parts – the old city and the new city. The old city is separated by a10 km long wall surrounding it. Also it has eight Gates leading out of it. The new city is outside the walled city. Jodhpur is a very popular tourist destination. The landscape is scenic and mesmerizing. Jodhpur city has many beautiful palaces and forts such as Mehrangarh Fort, Jaswant Thada, Umaid Bhavan Palace and Rai ka Bag Palace. Other charms of Jodhpur include Government museum and it’s beautiful Umed garden. The city is known as the “Sun City” because of its bright and sunny weather throughout the year. Jaisalmer , which is another city located in the middle of the desert is acclaimed to be the Golden City . The Golden Fort , Jain temples, Camel Safari, Sand Dunes are the highlights of the city of Jaisalmer. The Golden Fort is a 5 storied structure built with yellow stones, giving a golden outlook.The town stands on a ridge of yellowish sandstone, crowned by a fort, which contains the palace and several ornate Jain temples. Many of the houses and temples are finely sculptured. It lies in the heart of the Thar Desert and has a population of about 78,000. Being a wonderful holiday spot, there are plentiful accomodations available for the tourists for all levels. Top class stays would need some driving to the outside of the cities. But mid-range and average stays are many at the centre of the city itself. The best time to visit and explore the cities of Rajasthan is within October and March. There are innumerable tour packages available in the market that caters the needs of every kind of tourists. I am Susan Hannan from Exams Key; it gives 100% 117-201 Exam Questions. Let’s take benefit of A00-211 Exam Questions material efficiently and get guaranteed success. Check out free demo of all certifications Exam. I would love to see the Blue City. Looks fascinating. liked your article very much.